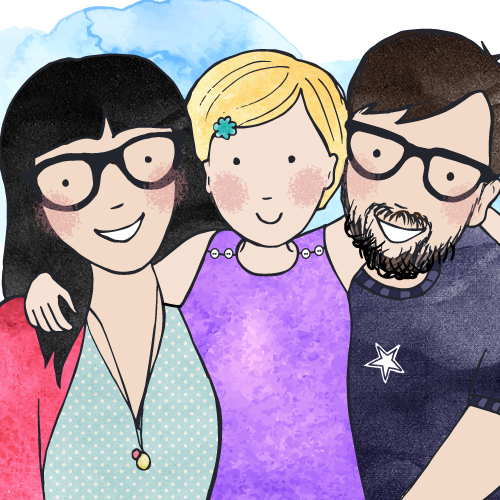 Dear mummy, festival frenzy has hit the UK with the start of the festival season! 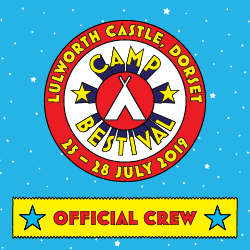 We’ve got 3 festivals to attend this year and are really looking forward to them after having such a great time at Funk the Family Festival. 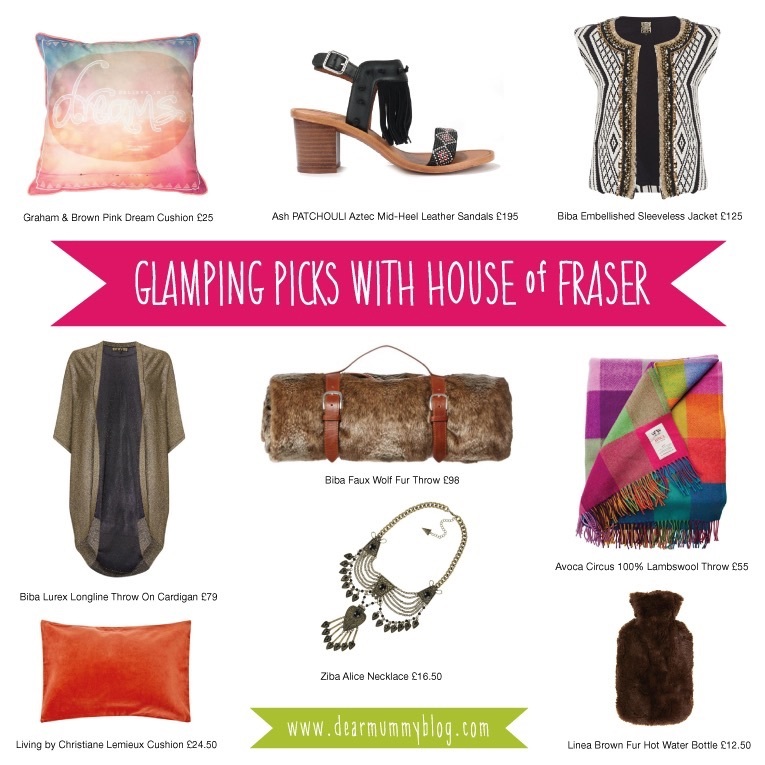 Blissfields is next so my mummy has been doing her research, finding the best items off the Internet and pinning ideas, however she was most impressed with House of Fraser’s range of festival goodies. There’s far too much to show, but here’s her top picks for festival Glamping in June and July 2015. Let us know what you think! These throws and cushions would make my festival cart and our tent super comfy! My mummy loves the 100% Lambswool Avoca Throw and would love to test out its durability at a festival. Last year we visited the main Avoca Shop in Belfast while visiting Grandma and had a lovely cup of tea and slice of cake in their cafe upstairs. She loves their fashion and comfy throws. It’s great that House of Fraser have finally brought Avoca to the masses. They even have a throw called ‘Donegal’ – where my Grandma was born!! Check out the range of fabulous throws and cushions from the homewears department at House of Fraser today, perfect for glamping! Dear mummy, we are excited about this next post. Some of you may be aware from twitter that we recently commissioned the talented Idle Cans www.idlecans.co.uk to decorate our festival cart after seeing an exhibition in Basingstoke. 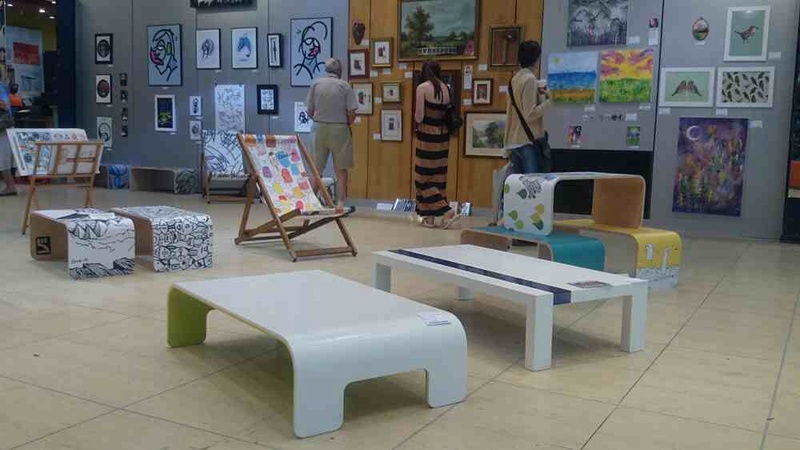 It all started over a month ago, when we visited Basingstoke Festival Place shopping centre, and saw a really cool pop-up art gallery. The shop was run by local artists in Hampshire as a way of showcasing their work to the masses. It’s a fantastic way of bringing art to the retail sector and gives people the opportunity to purchase some great one-off pieces. 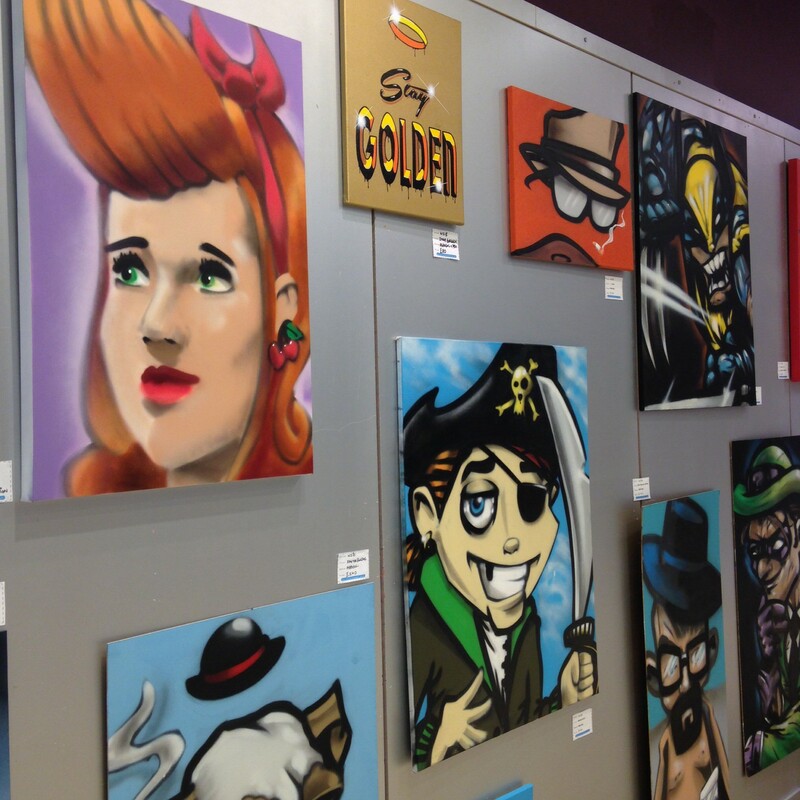 The gallery features Illustrators, street artists, sculptors, furniture designers and fine artists. We particularly liked Kev Munday’s artwork and he uses different types of media to display his graphics. He has just finished decorating great-grandfather clock! You can find the pop-up shop at www.allourownwork.co.uk and on Facebook. Idle Cans had been recommended to us as the perfect artist to embellish our festival cart which we bought off Amazon for the bargain bucket price of £30! Considering it’s at least £60 to hire one at a festival, this was a real bargain. We purchased it to carry stuff from the car to the camping site at Just So Festival and also to cart me around in during the event, as an alternative to a buggy. Carts are great to wheel over hard terrain due to their large wheels and sturdy chassis. So we contacted Idle Cans to get a quote. He replied back very quickly and professionally with a reasonable quote to cover the cart with his custom artwork. He’d never done anything like this before and was up for the challenge. So what and who is the mysterious Idle Cans? Idle Cans is infact a Graffiti and Street Artist called Nzie, who set up Idle Cans Ltd 2013 nearly 10 years after his arrest for graffiting trains and public walkways. He wanted to do something positive with his talent and to set a good example to others. Since 2003 he has been promoting the positive side of his art and is now a legal street artist running kids workshops in schools, helping paint local government murals and using his skills to bring joy to many children’s lives. What a great turnaround! 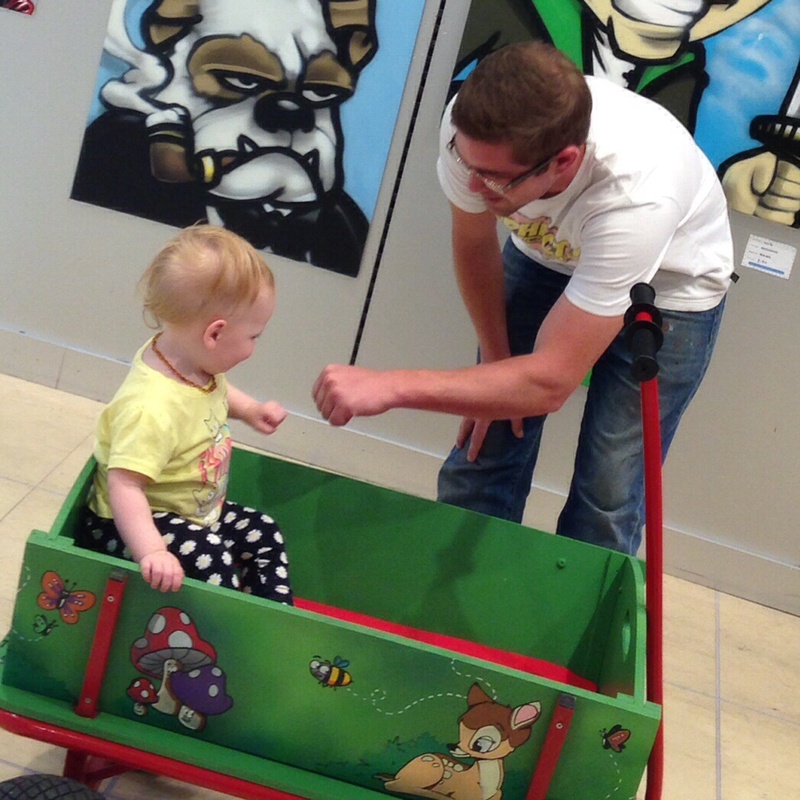 We delivered the cart to him in the pop-up gallery and within 2 weeks it had been completed! Very speedy! We were amazed at the results. The design brief was to create a woodland scene on the sides and to commemorate my first camping and festival experience. He had personalised my festival cart with my name and added little toadstools and woodland animals. It looked very Disney but in a funky street style way. We were very impressed by the artistic drawings and the spray paint finish. We got so many lovely comments from the gallery staff when we came to pick it up and mummy and daddy towed me through Festival Place to give it a test drive. When we were at the Just So Festival, loads of people stopped to stare in awe and we had some lovely comments on the design. I got a high-five from Idle Cans and must have been his youngest customer. When we got to Just So Festival, a lot of other families had their own personalised carts but mine stood out a mile. 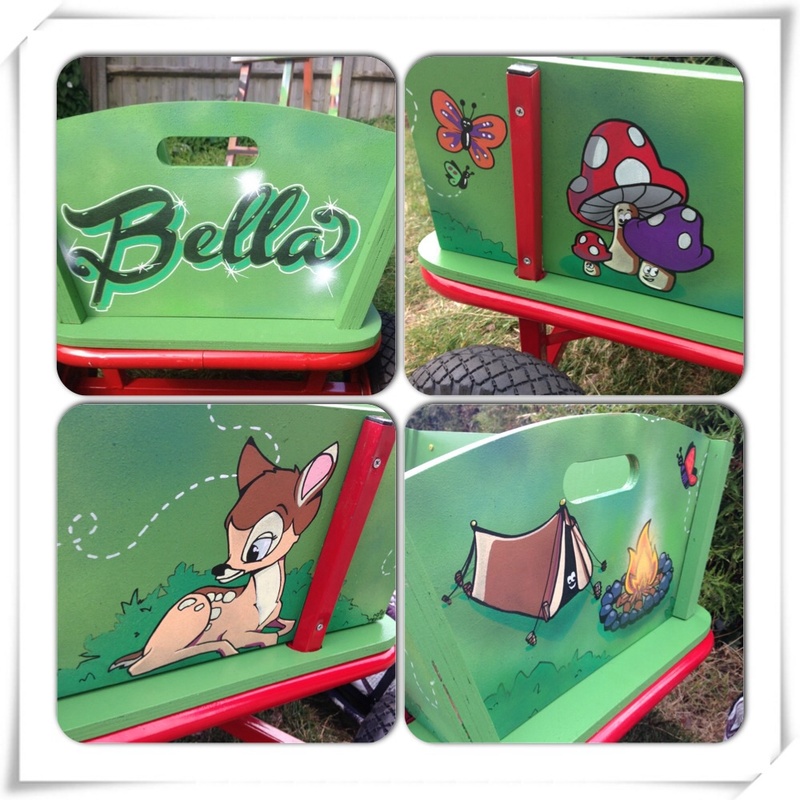 Idle Cans did a fantastic job on it and we would recommend his services to anyone looking to personalise a festival cart, or commission a funky bit of street art. He is very talented and looking at the other artwork he does that boyz got skilz. 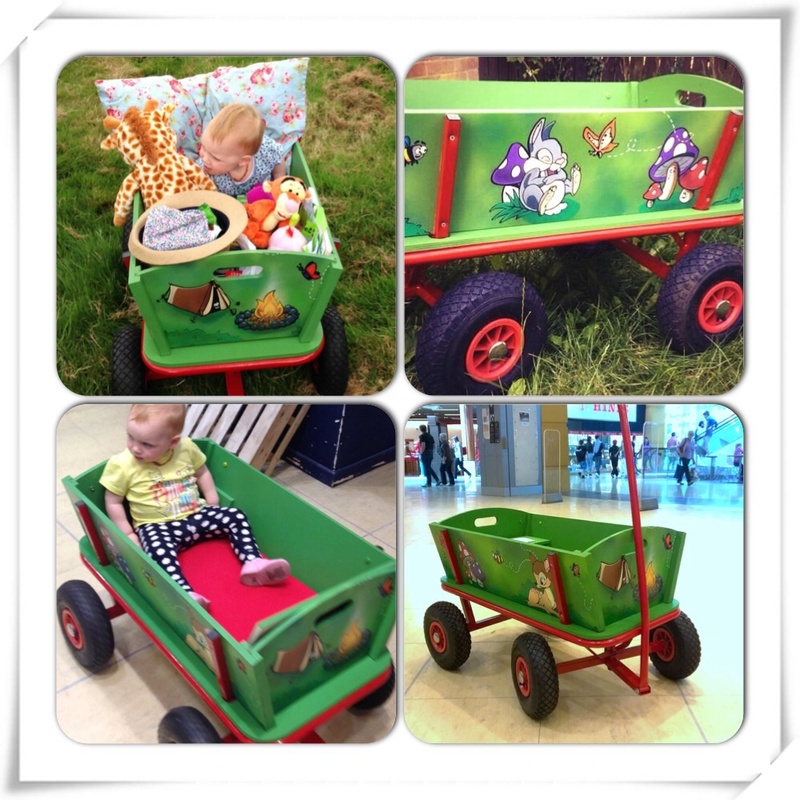 Thank you Idle Cans for my beautiful cart 🙂 We can’t stop raving about it enough! I’m sure we will attend many more festivals with it and will be a part of my memories growing up. A future family heirloom? I think so!